- Echo Spot is designed to fit anywhere in your home. Use 2nd generation far-field voice recognition to watch video flash briefings, see music lyrics (UK only), weather forecasts, to-do and shopping lists, browse and listen to Audible audiobooks, and more. All hands-free. Just ask. 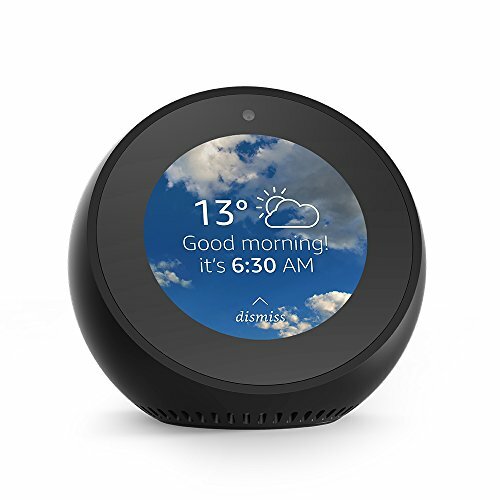 - Echo Spot connects to Alexa, a cloud-based voice service to play music, read the news, answer questions, set music alarms, control your smart home, and more. - Just ask to play a song, artist or genre, and see lyrics (UK only) with Amazon Music. Also, stream music and books from Spotify, TuneIn and Audible. - Use the built-in speaker or connect to speakers through Bluetooth or a 3.5 mm stereo cable. With multi-room music, you can play music on your Echo devices in different rooms (available for Amazon Music, TuneIn and Spotify. Bluetooth not supported). - Control your compatible smart home devices. Ask Alexa to turn on your lights, show baby monitors and front door cameras, and lock your doors. Plus, control your thermostats, plugs and more.